Chris Taylor and Gas Powered Games apparently decided to try something new. They must have wondered, at some point after completing Dungeon Siege II in 2005, how players would react to a role-playing game where all of the tedious elements were removed -- you know, things like equipment, character development, and dialogue options -- those (annoyances) that really detract from the fun parts of the game. And so they removed all of those things from Space Siege, their latest offering, but the result is something that is barely a game at all, let alone a role-playing game. I can only hope that players will react the same way I did: by uninstalling it and excising its memory from their brain as quickly as possible. Space Siege takes place in the year 2202. Humans have finally figured out a way to explore the stars, but in the process they bumped into another civilization called the Kerak, and the Kerak responded how lots of alien civilizations react in science fiction stories -- they decided to obliterate the humans. Humanity got advance warning about this, and they prepared some colony ships to flee the solar system, but their preparations took too long, and the Kerak assault force showed up before the colony ships could escape. You play as a soldier named Seth Walker in the game. Your character is fixed; you can't change his name, appearance, or gender, and there aren't any classes or races to choose from. You're stationed on the colony ship Armstrong, and your ship is one of the lucky ones. It survives the initial attack, but before it can get away, a Kerak assault pod attaches itself to it, and aliens start spilling inside. That leaves it up to you to clear the ship of their evil presence and presumably save humanity. 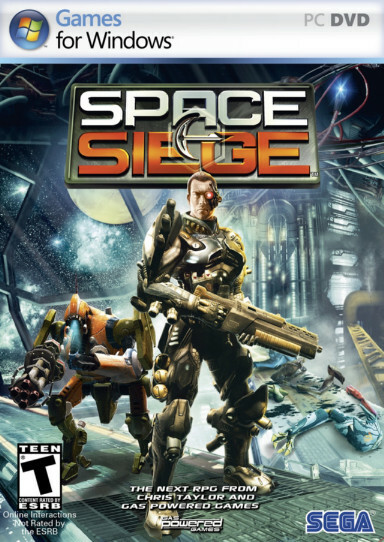 Space Siege is an action role-playing game with an emphasis on action. You only find a handful of weapons and cybernetic parts, and there aren't any other pieces of equipment. You don't gain any levels or experience points, but you sometimes find (upgrade materials,) which you can use to purchase upgrades or supplies (such as health packs and grenades), and you sometimes receive skill points for completing quests, which you can spend on the game's 29 skills. And the campaign is linear, with almost no meaningful dialogue or choices or story development (and the minimalist story, such as it is, ends up mostly being a rip-off from I, Robot, but I guess if it's okay for Mass Effect to (borrow) from Frederik Pohl, Space Siege can borrow from Isaac Asimov). That is, Space Siege is all about killing robots and aliens. To do so, you left click to move your character and you right click to attack enemies. You get a hotkey bar for your skills (such as (shield,) which makes you invulnerable for five seconds), and there are a few other useful keys, such as H to use a health pack and E to evade damage, that make the control scheme about as streamlined as you could want. However, given the focus of the game, the interface isn't as helpful as it should be. For example, to evade you have to move the mouse cursor to the direction you want to evade in, which sounds fine except you also have use the cursor to target enemies. And so to evade you have to move the cursor away from an enemy, press E, then move the cursor back to the enemy, then right click to attack again, and then repeat. That's not exactly the most convenient system I've ever seen. Worse, you're not allowed to configure the controls, and the easiest keys to use, the WASD keys and the spacebar, aren't mapped to anything.